The small town of Marathon in far west Texas (population 430) offers an unexpected oasis for weary travelers like us. My husband and I were traveling to Big Bend National Park, where we would spend time exploring, rafting down the Rio Grande, and visiting Terlingua Ghost Town. Since the road trip from our Dallas home is 556 miles long, we opted to spend one night in Marathon on the way down. Why Marathon? The Gage Hotel is there, along with its acclaimed 12 Gage Restaurant and White Buffalo Bar. Rancher Alfred Gage hired well known western architect Henry C. Trost to build the original two-story yellow brick building in 1927. It was first used as a railroad hotel. In 1978, Houston oilman J. P. Bryan and wife Mary Jon bought the old hotel for $30,000 as a renovation project. 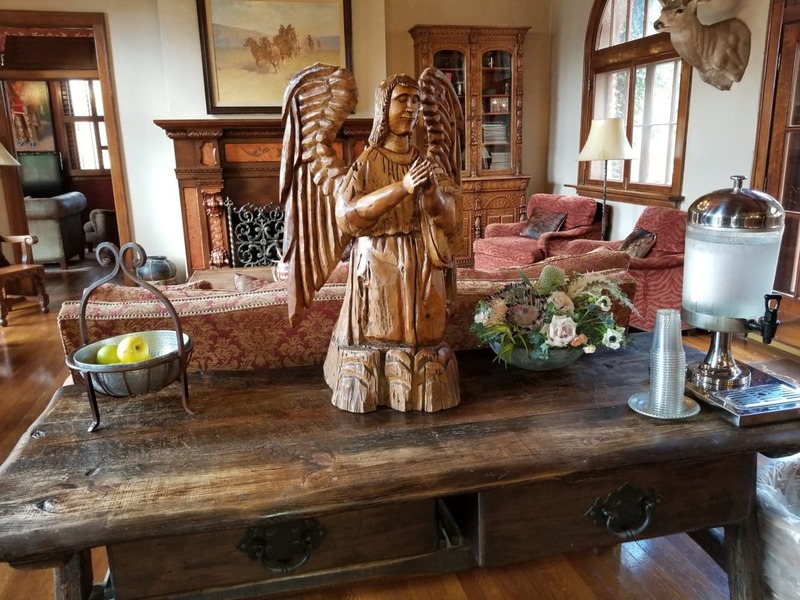 Bryan is also the visionary Western art collector who created the Bryan Museum in Galveston a few years ago to house his massive collection of eclectic items. The Gage proved to have “good bones” that only required renovating and a few additions. Thanks to the tender loving care lavished on the historic hotel by the Bryans, the 45-room property stays booked. It is a popular destination for visitors who flock to Marathon just to stay at the Gage, where rates range from $100-$300. Visitors quickly learn there are no TVs in the rooms. Since Marathon is at the top of the Dark Skies List, star gazing is the recommended after-dinner activity. Great views of the sky are available at Sky Park through a 24-inch Dobsonian telescope. Gage accommodations include adobe additions like Las Portales (where we stayed) and a number of casitas. The hotel also manages an 1890 home (restored in 2012) that was built for Marathon’s founder, ship captain Albion E. Shepard. The Gage Hotel boasts a huge pool, fitness center, full-service spa, and a spacious courtyard patio with outdoor fireplace and occasional musical entertainment. The nearby Gage Gardens, 27 acres of native plants with ponds, fountains, fruit trees, a vineyard and many butterflies, also has a nine-hole putting green and jogging loop. But the main draw for most who journey to the Gage Hotel is great food and drinks. 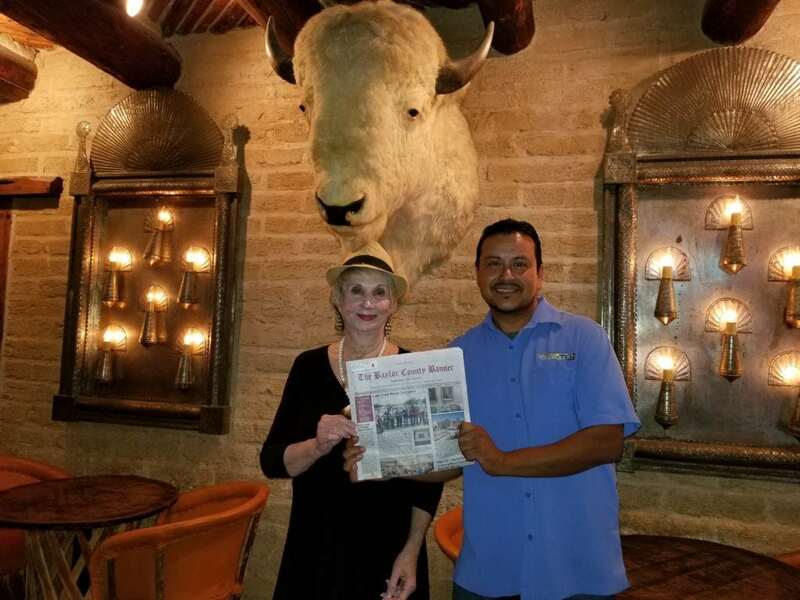 It starts at the White Buffalo Bar, where they serve some of the best Margaritas in West Texas right under the buffalo head. This tourist found the neon pink Prickly Pear Margaritas every bit as delightful as advertised. We followed this with dinner at 12 Gage, a five-star restaurant that dishes out authentic Southwestern cuisine. New Chef Joe Rodriguez demonstrated that he was more than capable of turning out one incredible dish after another. Two of us split a huge Trost salad (baby greens, toasted pecans, celery, red onion, egg, bacon shallot vinaigrette, peas, corn and tomato) which could have been a meal by itself. We also split a bottle of 12 Gage Red, a really decent Cabernet Sauvignon, with dinner. My Beef Tenderloin Filet with Bordelaise sauce was perfectly seasoned and grilled, accompanied by green chile scallop potatoes and asparagus spears. My husband raved about his succulent Roasted Bone-in Pork Chop as well, which was about twice the size of a normal serving. Entrees range from $18-$49; elk, quail, and other wild game dishes are featured on the menu. The waitress explained they had already run out of one popular dish, the Elk and Buffalo, bacon-wrapped meatloaf with tomato jam. Dessert offerings like Mexican Milk Chocolate Oreo Tart, strawberry shortcake, and Snickers Pots Du Crème Milk Chocolate Mousse sounded yummy. Each was priced at $10, but no one could eat another bite. It was time to call it a night and go look at the stars! Previous articleMidlothian Chef Kenzie Mills Returns To TV In Top Chef Jr.